At the beginning of the 2015 the UAE property market has witnessed decline in sale prices, which averaged about 9.6% across all submarkets. Hospitality sector which is one of the most attractive sectors in the region has witnessed hotel occupancy down by -1.4% in 2015, although the hospitality sector performance is still strong in global context. Various offers from real estate companies in UAE aims to encourage investment and to pour interest in the emirate’s real estate sector is likely to impel the UAE property market growth in coming years. Moreover, developers are taking more aggressive and imaginative approach to grabbing the deals and getting significant presales off the ground amid growing competition and fear of a downturn in the UAE property market. According to Goldstein Research, amid declining oil prices, milestone such as Expo 2020 and the introduction of VAT will play an important role in improving the UAE’s property market. Goldstein Research analyst forecast the UAE property market to grow at a CAGR of 7.4% during the forecast period 2016-2024. Further, the UAE property market accounted for the USD 74.3 billion in 2016 which is likely to reach USD 132.5 Billion by the end of 2024 attributed to the growing tourism and rising foreign investment in real estate sector. The report covers the present ground scenario and the future growth prospects of the UAE property market for 2016-2024 along with the total revenue of real estate sector in every region. We calculated the market size and revenue share on the basis of revenue generated per segment and region on country level. The revenue forecast is given on the basis of number of real estate developers and current growth rate of the market. Based on ownership type, buyers segment accounted for the largest market share of more than 62% in 2016, but average property prices in UAE have dropped by +1% in the same year. On the other hand, rental property industry is the fastest growing segment owing to continues declining rental prices of residential and hotel properties. 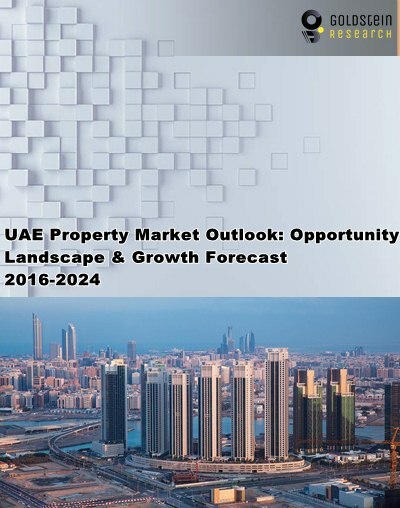 UAE property Market Outlook 2016-2024, has been prepared based on an in-depth market analysis from industry experts. The report covers the competitive landscape and current position of major players in the UAE property market. The report also includes porter’s five force model, SWOT analysis, company profiling, business strategies of market players and their business models. UAE property market report also recognizes value chain analysis to understand the cost differentiation to provide competitive advantage to the existing and new entry players. Emaar, Damac Properties, Nakheel Properties, Deyaar, Union Properties, Ras Al-Khaimah Properties (RAK Properties), Meeras Development, Aldar Properties, Dubai Properties, Jabal Omar Development Co, United Development Company, Wasl Asset Management Group (Wasl Properties), Arenco Real Estate, Ezdan Holding, Barwa and Talaat Moustafa Group Holding. According to our UAE property market study on the basis of extensive primary and secondary research, one major trend in the market is the declining prices of rental apartments and villa in UAE, which is likely to impel the growth of property rental industry in the region. Affordable villas in Dubai continue to be the hottest property in UAE. According to the report, major driver in UAE property market is the growing transaction value and investment in UAE’s real estate sector, which has resulted in the number of new development projects in UAE’s property market. Dubai is presently, perceiving increasing interest from international investors, which has reinforced confidence in UAE’s real estate sector and its future prospects. Further, the report states that one challenge in UAE property market is volatility in oil prices. UAE is oil based economy and declining crude oil prices poses challenges for the growth of country’s real estate market as the government faces declining property prices. Geographically, Dubai accounted for the highest revenue share in UAE property market with around market share closely followed by Abu Dhabi. Dubai is likely to maintain its dominance in UAE real estate sector owing to growth of tourism and increasing demand for office spaces during the forecast period.